You can now subscribe to receive new Restoring an Icon posts straight to your inbox! Sign up here. Building or restoring a vessel would be nearly impossible without scaffolding and the ability to lift heavy objects into and out of the ship. In the 1790s, scaffolding was a simple system of wooden posts, crossbars, and planks that allowed for access to all parts of the vessel. Today, we use lightweight interlocking aluminum and steel scaffolding to serve the same purpose. Two hundred years ago, sheers (a set of legs and block and tackle that created a simple crane) were used to hoist in or remove the lower masts of a ship or heavy cargo. Today, mobile cranes have eliminated complex hoisting systems and the need for many men to perform the work. The hand-colored engraving below illustrates how wooden scaffolding was erected in elevations as the hull was constructed. In the upper right corner, workers are seen using a block and tackle to hoist a compass timber. By the mid-19th century, through the advent of dry docks, the lower part of a ship’s hull was exposed for work but it did not eliminate the need for scaffolding. Shipyard workers used the stepped sides of the dry dock, known as altars, to support the wooden scaffolding. Platforms were also suspended from the ship itself, enabling men to hang over the side and access hard-to-reach parts of the vessel. Cleaning a ship’s bottom, replacing copper sheathing, and caulking the lower hull were all tasks rendered easier by the accessibility of a dry dock with scaffolding. After the American Civil War, Constitution was rebuilt in the Philadelphia Navy Yard and outfitted as one of the two vessels to carry the United States exhibits to L’Exposition Universelle in Paris in the spring of 1878. Sheers were used to load and offload cargo, including three pieces of railroad rolling stock which were tied down on the spar deck. The engraving below illustrates the use of heavy sheers and enormous pulleys and blocks and tackle to lift away large crates from Constitution‘s decks and hold. In 1881, Constitution sailed for the last time. She was decommissioned by December 1882 and taken to the Portsmouth Naval Shipyard where a large barn was built over her spar deck. Constitution was berthed next to a stationary pierside set of sheers that was used to load the construction materials onto the ship. 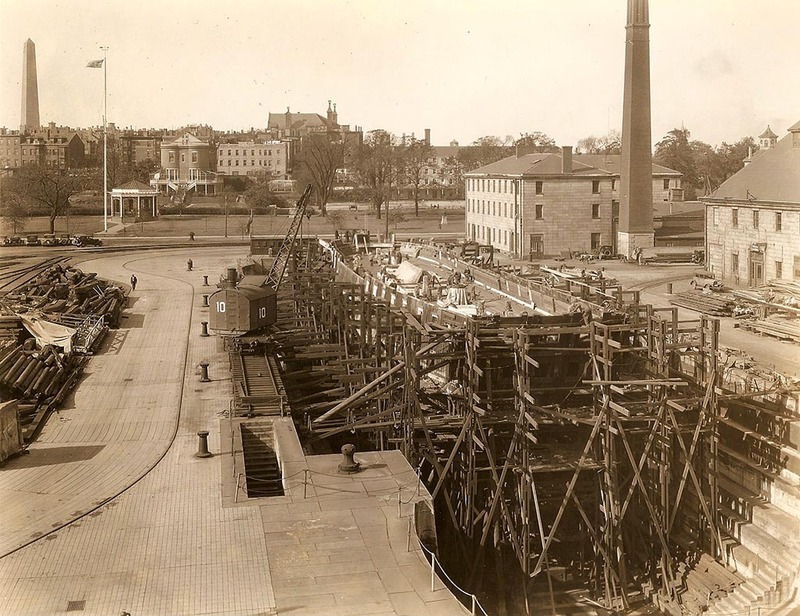 Mechanical cranes were used during Constitution‘s first true restoration in 1906-1907 in the Charlestown Navy Yard. There are several advantages to using cranes as opposed to sheers. Cranes can lift heavier weights, are mobile, and take fewer people to operate. By the 1927 restoration of Constitution in Dry Dock 1 sheers appear to be completely replaced by mechanical cranes of various sizes. In the photo below, there is one crane purposely set on railroad tracks next to the dock for loading and offloading materials from the ship. Note what appear to be a wider set of tracks that wrap around the dock, possibly for a portal crane which could move about the Yard along the tracks. While cranes technology evolved throughout the 19th and 20th centuries, scaffolding remained remarkably unchanged. A cacophony of wood surrounded the vessel as the navy yard workers replaced 85 percent of Constitution‘s structure between 1927 and 1931. On October 28, 1929, a purported 10,000 spectators gathered around Dry Dock 1 to watch the installation of Constitution‘s new bowsprit. A lucky Navy Yard worker got the ride of his life as a crane maneuvered the bowsprit through the air. His job was to guide and direct the 65 foot spar into a narrow gap in the ship’s bow. The variety of cranes at the Charlestown Navy Yard included floating derricks, seen here removing one of Constitution‘s lower masts. These cranes were able to float to wherever the ship was berthed, eliminating the need to either dry dock the vessel or move it to a particular pier for work. In 1942, the Navy ordered eight 20-ton cranes from the American Hoist & Derrick Co. of St. Paul, Minnesota. Fifty years later, Crane 30 (formerly Crane 63) was still in use and is pictured below at the beginning of Constitution‘s down rigging in preparation for the 1992-1996 restoration. All eight cranes were portal cranes and could only be moved around the dry docks and the Navy Yard on iron tracks. 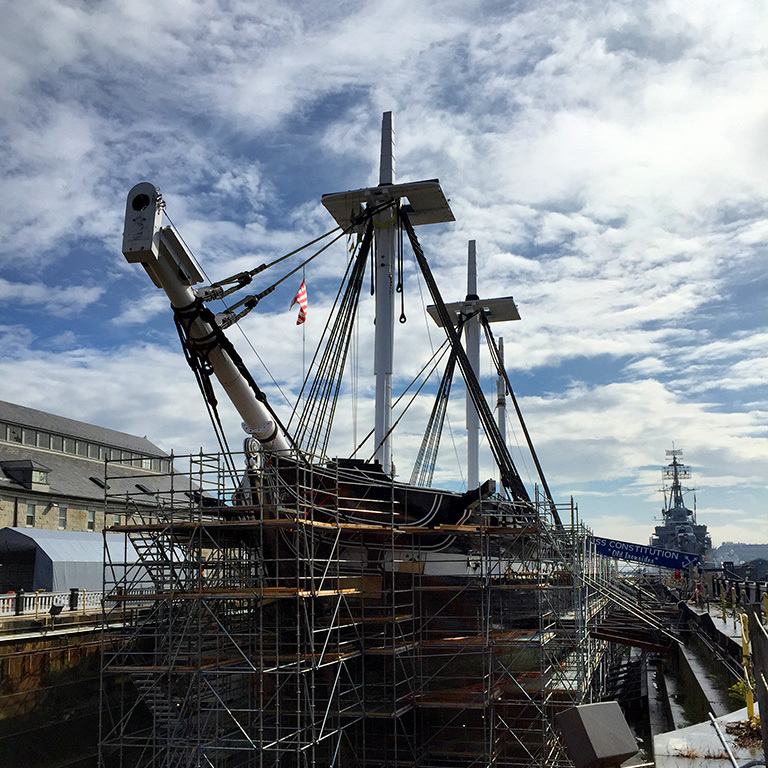 Toward the end of Constitution‘s 1992-1996 restoration, three new lower masts were installed. 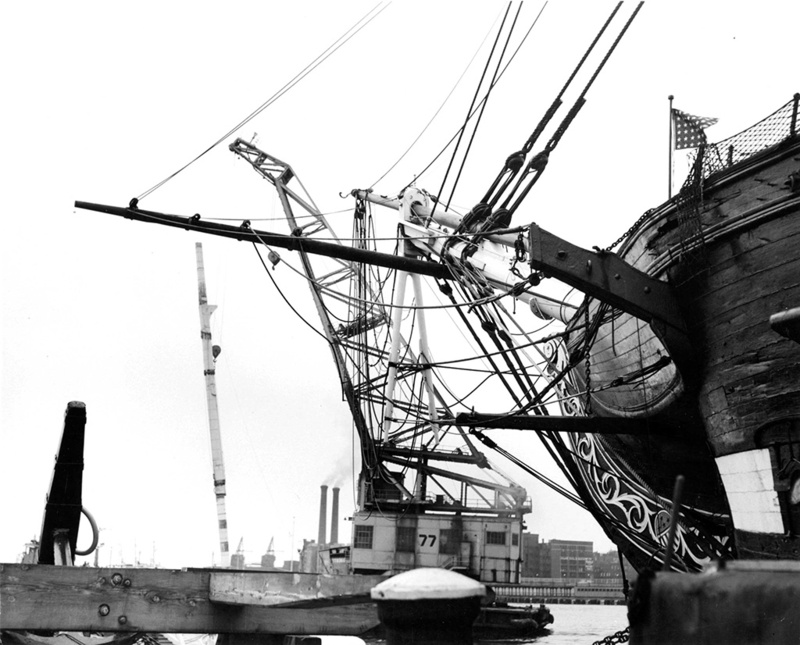 With Constitution stationary in dry dock, a taller crane was needed to hoist the masts up and over her nearly 4-story hull. By the late 20th century, scaffolding was no longer wooden posts and planks, but had graduated to aluminum and steel poles and platforms. In the 21st century, the cranes are completely mobile and can be driven anywhere around Dry Dock 1 and the Yard. In order to do work aloft, Naval History & Heritage Command Detachment Boston riggers are safely harnessed within a “man basket” suspended from the crane. Unlike in 1929, riggers no longer ride the spars during installation on the ship. The scaffolding used today has built-in safety features, such as anchor poles on which to clip harnesses, non-skid platforms with edge guards to prevent falls, and handrails on staircases. The need to hoist heavy timbers and access hard to reach places on Constitution‘s hull is the same today as it was 200 years ago. With modern scaffolding and cranes, this restoration work has become safer and more efficient. Happy Birthday, USS Constitution – 218 years young today!